Lovely eggs as part of a lovely story. I need to look more into this topic. I think breeds are essential, for they are genetic INFORMATION that can be lost forever. As 'preppers' we can't go starting a zoo [i wish] so we must choose the best breeds for survival situations. Ideas for other great breeds? Loved that summertime film. The little bantam Sebrights were so sweet, and I was surprised at the size of the eggs coming from them. The lay-rate, he said, was only 80-100 eggs per year. A typical heritage breed hen will provide maybe triple that number of eggs in her prime years. But given that the banties probably eat less feed, it could be cost-effective to have more of the Sebrights than you might have kept of larger breeds, perhaps making up for the difference. The only negative that I've read about them is that they're difficult to raise from chicks due to their susceptibility to disease / high mortality rate. Also less cold-hardy in the North, but maybe a good Southern choice? Thanks so much for sharing about them! That was my first time to see the Sebright and they are truly a beautiful bird, and as the narrator said, people have bred them for their appearance. A friend ordered Icelandic chickens at the same time I did, but my source sent me a letter very early this spring informing me that mink got into their chickens, and killed many, including most of the Icelandic. The friend who now has adult Icelandic is not too thrilled with them because they have been too slow to start laying. But that would be OK with me, as we need tick control first, and eggs later. Tick control is an absolute must, as this year they were worse than ever. Even if we only get an occasional egg, it will be fine as long as tick numbers plummet. The Icelandic is supposedly better at foraging than many other breeds, but if they are confined, one would not notice that ability. So this next spring when our Icelandic chickens OR guineas of some variety arrive, an update will be posted here, especially about their tick-eating abilities. I'm so excited for you, that you're getting hens Ilinda! They should get along fine with the goats if they share pasture. I'm guessing you'll become very attached to them and vice versa! Soc, You had asked for breed ideas. As far as heritage breeds, I like clean-legged, cold hardy breeds with high lay-rate, brown eggs and body weight under 7# so that smaller members of the flock are in less danger, as we keep a mix of breeds and ages. Also there's a better feed conversion ratio with medium-sized layers that are very productive, unless you're breeding them for meat. As far as my favorite goes, nothing outperforms a pure-bred Rhode Island Red. You can tell a pure strain by the complete absence of white anywhere on the bird, and sometimes she'll have long black tail feathers like the roo. After them, my second favorites are Australorps, New Hampshire Reds, Dominiques, Welsummers, Plymouths and Wyandottes. Do you notice any reduction in ticks due to the presence of chickens? All around the yard near the house, we never pick up ticks. We only pick them up when going into the brush, such as when picking wild berries. That is the convincer I needed. Guineas are known for their appetites for ticks, but whether chickens were/are tick eaters seems controversial. You've just convinced me. Another convincer came in an email last night. I had asked GuineaFarm.com people about all their beautiful guineas for sale, eggs and keets, and whether guineas eat honeybees and bumblebees. They replied that the rumor is that they do, but they do not see it. They said that if absolutely no other insects were available, that they suppose it could happen, but it is definitely not a normal food for guineas. They do eat ticks and many other bugs that would otherwise eat our gardens, or us. So, I'm doubly convinced that guineas are coming to this homestead next spring. Solani, I have a feeling that you'd really bond with your hens if you got at least a few. They can be so sweet, except for the queens who are sometimes downright mean. If introducing younger generations to an older flock, I've found that as long as they are placed together before the youngsters' combs are mature, somehow the queens are able to "read" that as being non-threatening. I'm also unable to eat rabbit. A childhood friend of mine, years ago, went to a great deal of trouble to hunt and cook a rabbit for me, and I was unable even to taste it! I felt so bad for all the effort that he had put into it. Would love to see photos of both the Norwegians and Belgians. I did ride the neighbors' horses, but have mostly ridden a mule here recently, exercising it for a friend who now has Parkinson's Disease and can no longer ride. However, mule is around 20 years of age and the vet says he can no longer bear weight safely. I did learn to canter on him though in his better days, as he has such a smooth gait and I wasn't afraid with him. Have only ever galloped unintentionally! As far as the difference between riding horses and mules, I found the riding helmet to be absolutely essential with the mule, as he would find incredibly creative ways to try and unseat me (unsuccessfully!). Some - but not all - who have purchased them in the past say that as soon as they're allowed out to graze, they fly up into the trees and may or may not come back home, not having the strong homing instinct of more domesticated breeds that have been broken in (not allowed outside a totally enclosed henyard for at least the first few weeks). Another option to consider is simply giving them an ample fenced yard, contiguous with the coop, with over-head covering, or move them about in a tractor pen. Anyway, I remember neighbor Elsie, said that you train your guineas when young to go into their little shed, and you lock them up each night to prevent that tree-roosting. We had chickens do that years ago, and once they start that, it's nearly impossible to stop. Anyway, her guineas were entertaining, pretty, good bug eaters, and could be loud at times, as they are said to be excellent "watch dogs". I want tick control mainly. Another friend had guineas and she said they all eventually roosted in trees, which makes them fair game for raccoons, which is what happened to the only chicken flock I ever had. So, before the little guinea keets arrive in May, I'd better get busy building a little guinea shed for them at night. And, re another post about horses/mules, here's what a neighbor with mules told me more than once. He has had mules for years, and he said, pointing to the creek and the culvert over it, "I can walk a horse over to the edge and get him to go right over, but I could never do that with a mule, because they are way more intelligent than a horse." I don't know one way or another about what he said, but thought it was interesting. Maybe it's sort of like the difference between intelligence of wolves vs. dogs. Wolves beat dogs in intelligence tests because it has never been bred out of them. They HAVE to survive in the real world, without bowls of food laid before them daily, and a nice fluffy, warm bed by a fire in the winter, etc., whereas dogs are bred for looks more than anything, although some do try to breed for intelligence. Still wolves are smarter than dogs. I just don't know about the mule vs. horse comparison, but thought it's worth passing along. 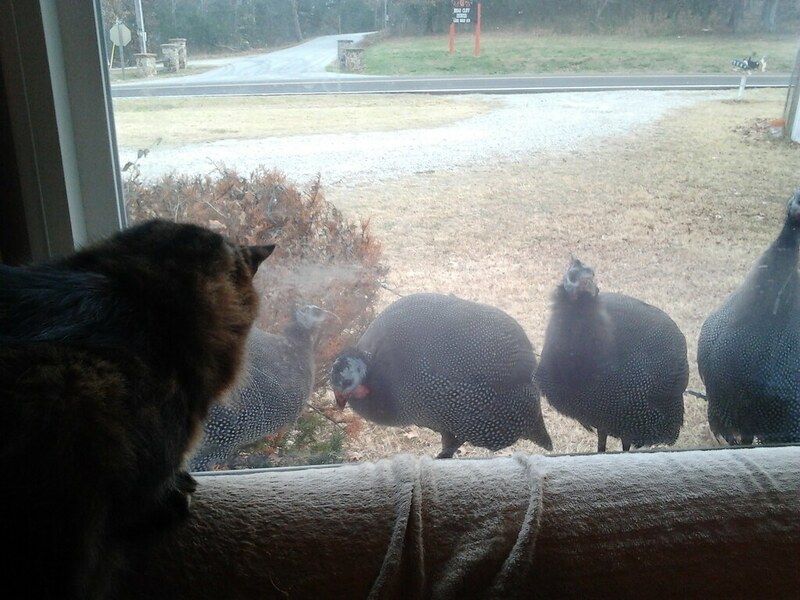 That's hilarious Ilinda, that the guineas would press their faces against the glass and peek in at you like that! It sounds as if you are meant to have them. Sounds like you have the right plan, to keep them closed in at least for the night.